In today’s reading from the Holy Gospel, the Lord refuses to give the leaders of the Jewish nation a “…sign from heaven,” but He instead tells them that they will receive “…the sign of the Prophet Jonas,” that is, as Jonas was in the belly of the whale for three days and came forth alive, Jesus would die, be buried in the earth, and rise from the dead on the third day. Now think about this. These men, no doubt the best informed people in that country, knew perfectly well that Christ had been working a great number of miracles that were both demonstrations of divine power and eminently useful and compassionate – exorcisms, healing, feeding the hungry, even raising the dead. But they still demanded that He prove Himself by something as spectacular as it was pointless, a “sign from heaven,” i.e., lightning bolts, an eclipse, shooting stars, etc. It strikes one as incredibly immature and shallow. Why would the leaders of this captive nation not rejoice that the poor and suffering of their own people, their own flesh and blood, were already receiving a truly great consolation? Why did they so oppose the one who was bringing them, both through tangible physical help and the liberating truth of His preaching, a real deliverance from oppression and sorrow? Their hatred of Jesus sprang primarily from envy. The patristic commentaries and the services of Great Week state this over and over again. They knew deep down that Jesus was the Real Thing, while they were spiritually bankrupt phonies and power-seekers, and instead of bringing them to repentance, this knowledge filled them with envious hatred. Both parties, the Pharisees and Sadducees, had made idols out of some outward thing: the Pharisees were busily constructing a nitpicking, complicated, oppressive, and ultimately meaningless code of behavior to replace the true practice of the Mosaic Law, while the Sadducees worshipped their own authority as the priestly caste and the glories of the Temple worship over which they presided. Both parties were determined to project a false image of their supposed spiritual superiority, which gave them power over others. The resulting emptiness of their inner life corresponded precisely to the inanity (literally “emptiness”) of this absurd cosmic fireworks show they were demanding from the God-Man to prove His credentials. Their brand of religion was all about outward show. Today we might say that it was all about marketing. 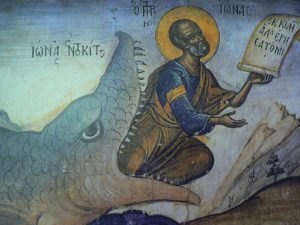 How do we prevent ourselves from falling prey to false religious leaders who maintain their authority through outward show but are actually apostate by reason of their having renounced the confession of the Orthodox Faith? It get backs to the basic question: Do I want my faith to be the Real Thing? The Real Thing requires the narrow way Christ speaks of in the Gospel. Do want I want that, or do I want a reasonable facsimile thereof, a pleasant and, yes, convincing, simulacrum that offers a broad and smooth highway on which one can enjoy the sensations of a pretended spiritual, intellectual, and cultural superiority (“Orthodoxy, the Coolest Religion Ever!”) combined with worldly advantage? P.S. A suggestion for spiritual reading relating to this Gospel text: “On Miracles and Signs” by Bishop Ignatius Brianchaninov, which you can find at http://orthodoxinfo.com/ecumenism/st-ignatius-brianchaninov-miracles-and-signs.aspx.